Get ready for Scary Movie Month as Patrick welcomes writer/director TOM HOLLAND -- the man responsible for Child's Play, Fright Night and much, much more -- to the show for a conversation about all of his classic movies. It's awesome. Don't forget to follow @thehorrorchick and @tomholland_news on Twitter and tune into Tom Holland's Twisted Tales on FEARnet this November! I can not wait to listen to this while commuting! I know talking with Tom, a man you respect greatly in the genre, is a dream come true so this is awesome! Very cool! This couldn't have come at a more perfect time, either. I just a few days ago purchased Fright Night and Child's Play, both of which I've seen before and love, but for some reason didn't own on any format. Despite his struggling with names (I can relate), Holland seems like a very nice and awesome guy with a wealth of neat information to dispense. P.S. : I hope you feel better soon, Patrick! Great interview Patrick. I was only listening to the Movie Crypt episode where Tom Holland featured the other week and found him to be an interesting and enthusiastic speaker, so I was very glad to get the chance to hear him some more, this time through the F this Movie lens. Looking forward to Twisted Tales. Scary Movie Month is nearly here! Not sure about topic suggestions for your chat with Heather but maybe a follow on from Tom Holland's comments at the end of this show where he spoke of the enduring aspect of horror as metaphor. Possibly looking at its use as metaphor across time and across culture. I know this has been touched on in the past but if there is more depth there then hearing about the context in which to look at some movies in a different light would be very interesting for me and much appreciated. But at the end of the day any episode featuring Heather would be very welcomed! Thanks, Brad! This interview has been in the works for a while, so I felt a little c-blocked when that MC episode posted (it was a great interview, though, so I wasn't ACTUALLY mad). It was a challenge to try and make this one different, because I didn't just want to repeat the same stories/questions. You REALLY have to see Fright Night. You can skip the remake. You definitely succeeded in that. Didnt feel like a double up at all, and Tom H seemed to really enjoy it which is important. #SMM & Fright Night, perfect pairing. Very very very awesome. We Hollands are quite proud of Tom and his approachability and willingness to talk about his work. The family is proud. So proud. Finally caught up to this podcast - wow, what an opportunity and it was not wasted! I could listen to Mr. Holland talk about his experiences in the industry for hours. Like you say at the end, I totally do want to watch all of his stuff now. I'm slightly embarrassed to say I have not seen Fright Night - I will certainly rectify that this Scary Movie Month. 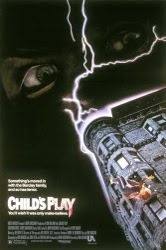 It's been awhile since I've watched Child's Play - a movie I loved when I was younger, so that will definitely be on the list as well, and I'm not sure how acclaimed it is, but I thought Thinner was really good too. I only wish I had access to FearNet to check out his latest but I'm a big fan of short horror fiction so I'll be on the lookout for his Untold Tales. In an industry full of jaded cynics, I think the thing I liked most about the interview was how positive and enthusiastic he still is about movies and the horror genre in particular. Thank you, Tom and great job, Patrick! Looking forward to Heather's return to the podcast later in the month! Cant wait for Tom hollands tales to be out there. Im even more excited about these now.